What is Trunk Side Recording and Extension Side Recording? One of the most frequent questions we get is: What do you mean by trunk side or extension side recording and why does that even matter? The key difference is where we tap into your phone lines and place the recording server. To best illustrate this, below are two images. One image of a recorder tapped into the trunk-side and the other is tapped into the extension-side. Which one is better for your business will depend on what you need recording for. The following article will discuss how both kinds of call recording configurations work, as well as the pros and cons of each, so that you can make an informed decision. How Does Trunk Side Recording Work? Trunk side recording records the incoming lines from your phone provider (ie. RingCentral, AT&T, Comcast, Verizon). The recorder is placed between the Outside telephone lines and your PBX. Essentially, this kind of system records all inbound and outbound calls. In simplified terms, the recording is captured cradle-to-grave; so if a customer speaks first to a receptionist, then gets transferred between multiple agents, that will all be saved in a continuous recording. It will even record the customer’s line while on hold. No internal calls (extension to extension) are recorded under this type of configuration. 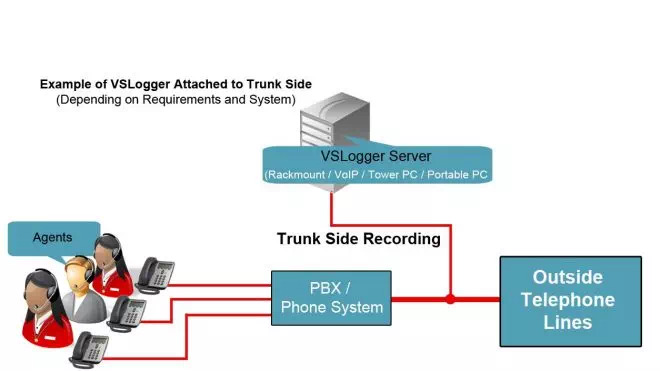 One of the biggest draws of trunk side recording is the installation and overall call recording coverage of your business. You only need to purchase licenses for each trunk line coming into your business to record 100% of your phones. A typical business usually has less trunk lines than they do extensions (phones after their PBX). So even if you add more extensions, you will not need to pay for extra licensing and you will not need to connect anything to the recorder, as long as you keep the same number of trunk lines. Trunk side recording is also highly compatible and works with standard and non-proprietary lines supported by different boards. Additionally, trunk side recording can be less expensive than extension side, depending on the overall number of lines to record. If your total trunk lines are less than the number of extensions you wish to record, trunk-side is more cost effective because you only need to purchase the number licenses to cover the trunks and not each extension. Note, even with trunk side recording, you can limit the extensions to actually record. 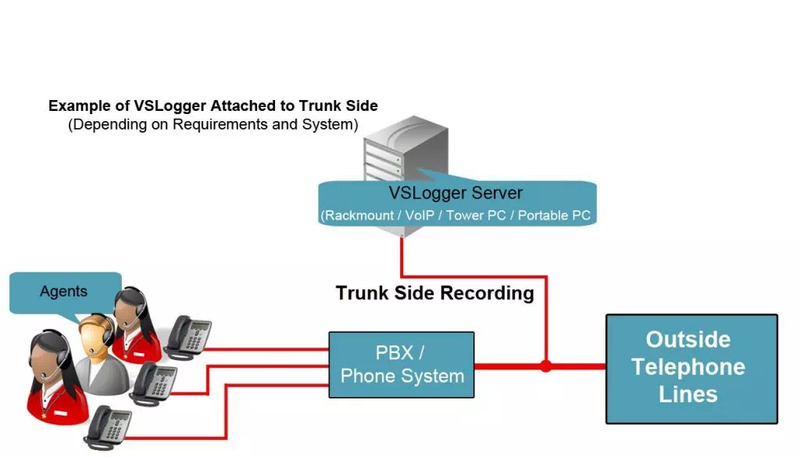 Once the call is over, the PBX will inform (via SMDR/CDR/CTI) the recorder what extension was just on that particular call, at this moment the recorder will either keep the recording or not save it. One limitation of trunk side recording is that it does not record extension to extension calls. Using this kind of setup, you won’t be able to monitor internal calls. It can also be hard to differentiate calls by extension number, particularly if the call was transferred multiple times. This can make it harder to search through calls by extension number, and it can be more difficult to enforce PCI and HIPPA compliance. Live monitoring can also prove to be difficult. 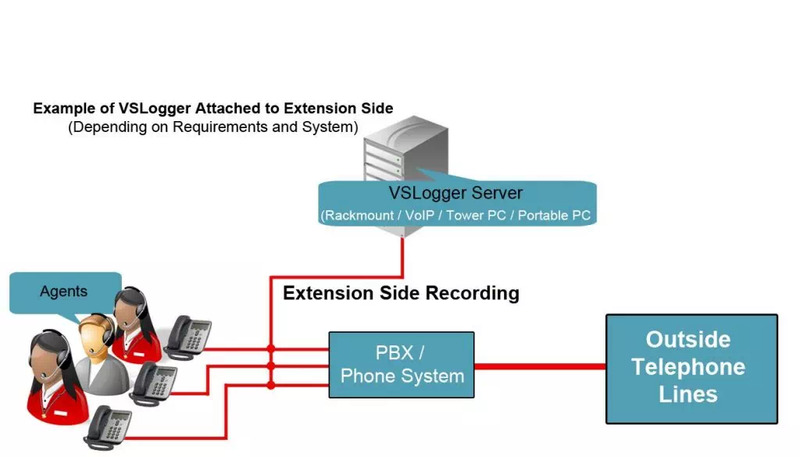 Because the recorder integrates with your PBX via SMDR/CDR/CTI, the actual extension information is not added to the recording until after the call is over. Therefore, when you click on the trunk line and start listening live, you are not able to see the specific extension that is on the call, and the only way for you to determine who is speaking on the call is to recognize your employee’s voice. Although trunk side recording can sometimes be less labor intensive during the physical install, the SMDR/CDR/CTI integration may prove difficult. Depending on the PBX and other factors, the calls may sometimes not have full extension details attached after the call disconnects. Additionally, if you want to ensure PCI or HIPPA compliance, and utilize our desktop assistant or custom integration, trunk side recording is usually not a preferred solution. Your best bet is to go Extension side if these are some of your requirements. How Does Extension Side Recording Work? Extension side recording captures calls on the internal side of your lines, essentially, after the PBX. With this configuration, you can tap directly into the specific extensions you want to record. In addition to capturing external conversations, extension side recording will capture internal conversations, such as consultations with managers and conversations with teammates. One benefit of extension side recording is the knowledge of which specific lines are tapped. With extension side, you are recording the specific phone on a dedicated recorder channel. Since the line is dedicated and usually attached to a specific agent, you know when he/she is actively on the line. If live monitoring is an important feature that you will be utilizing, then extension side recording is the preferred configuration. In the recording software, you will see which agents are on the phone and can select a specific person to listen to. Another benefit to extension side recording is not missing internal conversations. Since you are tapped into the extension side of the line, you will always capture internal communications. Additionally, since the recorder knows which extension is active, you are able to utilize screen capture technology to properly sync your calls and the agents screen. Complying with HIPPA and PCI also becomes easier since extension side recording can provide greater control during those live calls. The biggest drawback to extension side recording is the installation and compatibility. Because you are tapping each extension, if you are recording over 100 lines, you will need to tap each line. Additionally, the PBX manufacturer may have added something proprietary, and recording these types of audio calls may be difficult. Luckily, we have a fairly large compatibility chart and have been tested with a variety of PBX manufacturers. For a complete and ever expanding PBX compatibility list, please go here. Also, because you are connected to each extension individually, you must pay for licensing for each line. If you add more extensions that you wish to record, you will need to pay an additional licensing fee. For this reason, extension side recording can possibly be more expensive. However, if you have 23 lines coming in (trunk side) but you only want to record a small department, such as the sales department, which makes up only 5 extensions, then Extension side can be a less expensive solution. There are additional ways to record your audio lines, such as BIB, SIPREC, proprietary API based recording and other similar methods. These recording options are commonly referred to as Terminated recording, where the recorded device sends data directly to the recorder. This method will be discussed in another post. So which kind of call recording is right for your business? It largely depends on your business’s needs: Do you simply need to record external calls? Are HIPPA and PCI compliance not a large concern for your business? Trunk side recording might be the better, more cost-efficient option for your business. On the other hand, would you like to record both internal and external calls? 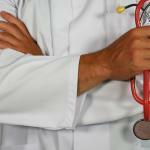 Is it important to live monitor employees? Is tighter integration with your internal systems important? If the answers are yes, extension side recording is probably the better fit for your business. Since there are a number of factors involved, we always recommend you speak with a sales account manager to properly discuss your recording requirements, desires, budget, and expectations. Once these are all properly discussed, a well-trained account manager can offer you the right solution to get you recording right away.